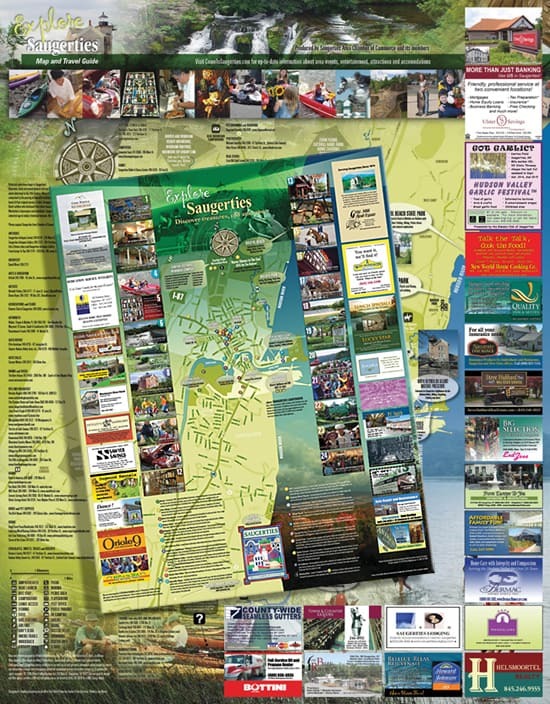 Several years ago, a local Hudson Valley business association asked if I would be interested in designing a map of its township with a listing of the business association’s membership and points of interest. The final map design would be a large accordion fold map that when laid flat (and unfolded) would measure 28″ x 36″.The concept was a simple one that had been done ad nauseam so many times before. We have all seen them, maps that acted as placemats with splattered Ketchup and coffee stained edges. It was another beautiful Hudson Valley morning and the business association president handed me samples of cartoon quality maps that featured businesses in the area. We sat sipping coffee at the local “Village Diner”. He showed me different examples of what he had in mind including the tissue quality map that lay under my silverware. It was apparent that there were some budget constraints placed on the project as well as several folks that had their own vision of what the map should look like. My past experiences with business organizations and non-profits made me prepared for the political nature of Membership Boards. However, I’m always eager to take on a challenge. 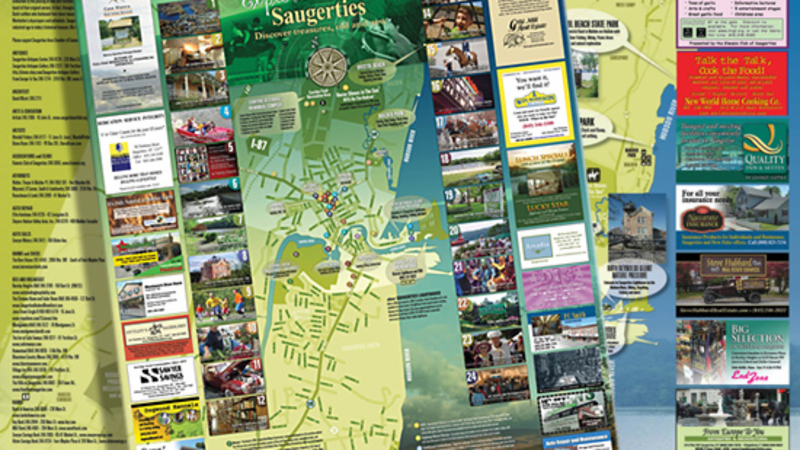 My need for a design challenge ius no better illustrated by this particular project: the 2007 “Explore Saugerties” map design. As map projects go, the designer usually gets some sort of collateral support, in the way of text, images and the general map details. Not this time though. Unlike most, this map project became quite involved. As time progressed I realized I was on my own. In order to complete the project in a timely fashion, I proceeded with the design responsibilities I had contracted to perform, and in addition, ad sales, ad design, copy writing, photography, photo illustration and retouching and printing supervision. In fact, I enjoyed the project so much that I designed and the 2008 map. What can I say, I love to see the New England countryside. The second time was a bit easier. To make it all worth while, both maps proved to be a huge success.